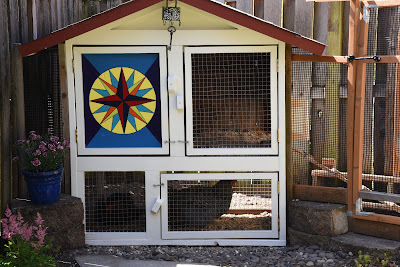 Here's my version of a Barn Chicken Coop Quilt Block! The girls home needed a pick-me-up because our Oregon winters had really beat it up. The original paint we put on it really showed its age. My Mariner's block had nearly disappeared which believe it or not, I had not really noticed until I started repainting it with new colors and fresh paint. This time around, I took the extra step of applying two coats of varnish on it hoping to extend the life a few extra years. I love the updated look, and I think the girls do to. Hubby redesigned their play area so that we wouldn't have to trudge through the play area to get eggs. Now that they can't get to the front of the coop (front porch area), I got to plant ground cover surrounding the stepping stones. Guess what! That area is so rich that the plants have already doubled in size. Who needs fertilizer when you have chickens. I haven't been able to get much sewing done but redoing the block on their coop counts too -- right! JoJo, the redesign looks fantastic! I bet those plants are loving their new home that the chickens helped prepare. I look forward to seeing it in a few hours!